You can say what you want about the last few drafts and the Bruins reaching on some players but they have put together an impressive group of prospects. Keith Gretzky, then Bruins Director of Amateur Scouting, knew what he was doing which is why it is no surprise that back in early August he was plucked from the Bruins to become the Oilers new assistant general manager. The drafts the “Great One’s” brother was sitting at the Bruins table for will heavily impact the future of the organization. And with guys like Danton Heinen, Brandon Carlo, Rob O’Gara (not a Gretzky pick), and Jake DeBrusk all making a bid to make the team the impact is happening sooner than later. Heinen, in my opinion, is on the team. Carlo, O’Gara, and DeBrusk have all played well enough to make the team but may be ticketed for the AHL. There is no doubt that these guys have proven to themselves and everyone else that they can play in the NHL. There is also no doubt that all of these guys will be making their NHL debuts at some point this year. It just may not be on opening night. This is the first preseason in recent years that I can remember where a rookie has truly pushed management to have to make a move or tough decision to make room on the roster. Now a trade may not happen to make room for these young guns but it still could, and maybe should happen. And it’s not just the prospects at the pro level that are looking good. 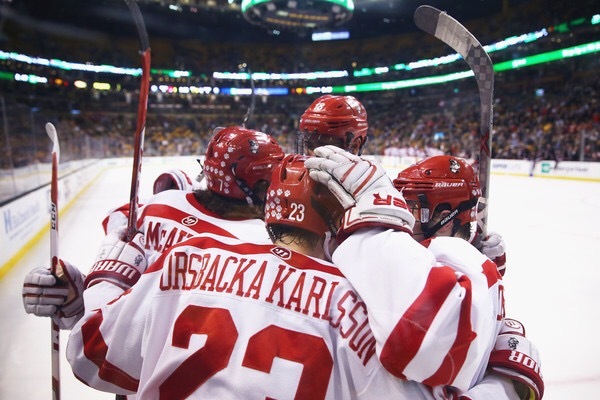 This weekend was opening weekend for NCAA hockey where the Bruins house many talented prospects. It was also the first weekend of games for the B’s prospects who where cut from camp and went back to their respective junior teams in the CHL. Almost all of them had great weekends except for maybe Zach Senyshyn who is on the rebound from a health plagued offseason. Charlie McAvoy, So. Boston University: 1GP, 1 assist. This was the season opener for BU and was their first meeting with ECAC’s Colgate since the early 90’s. Both McAvoy and JFK saw top line minutes and registered a point each in a game riddled by penalties with the ice heavily tilted in the Terriers favor. BU went about their business and grabbed a layup 6-2 victory while McAvoy saw a lot of powerplay action which showcased his poise and passing ability. He’s just such a smooth skater who was physical when he needed to be and moved the puck very well on the breakout. He seemed to have another gear many other players did not, almost Eichel-like in regards to his comfort and dominance skating with the puck like Jack had during his time at BU as well. We don’t want to get ahead of ourselves, but he already seems like a pro ready type of player that looks almost like he’s playing below his ability at the college level. Jakob Forsbacka-Karlsson was also a standout. He’s always engaged and seemed to have a knack for the dirty areas of the ice. In addition to the one goal he netted on a rebound, he found himself in the slot with multiple opportunities throughout the night but couldn’t quite put a few more home. He’s an extremely effective two-way player as advertised and created plenty of turnovers and frustration for Colgate. He is not as polished and as close to NHL ready as McAvoy but is certainly some one to be excited about as he trends in that direction. As a side note, Nashville prospect and BU freshman Patrick Harper also looked very impressive and is a name you should be prepared to hear a lot of. He netted two goals and was silky smooth. We would liked to see have seen McAvoy live in a more closely contested game as the Terriers were never really pinned in their zone. McAvoy was very precise on the transition game with everything Colgate gave him as well as dominant in the one-on-one battles he faced. We couldn’t help but think with Brandon Carlo having the strong camp he’s had with the Bruins that McAvoy is likely making a strong case right now to make the same jump to the Bruins blue line next year as well. Ryan Fitzgerald, Sr. Boston College: 2GP, 1 assist. Boston College was on the road in Colorado to play in the Ice Breaker against Air Force and Denver where Fitzgerald potted an assist. Andres Bjork, Jr. Notre Dame: 2GP, 4 goals, 3 assists – 7 pts. Notre Dame played a weekend series against new-to-Division 1, Arizona State. You could argue the stats are inflated because it’s against a new team but if you’re a stud you’ll feast when you’re supposed to. In two games Notre Dame beat Arizona State by a combined 13-4 (9-2, and 4-2). Bjork took advantage and had a huge weekend like he should. Ryan Donato, So. Harvard: 2GP, 1 goal, 1 assist. Harvard played an exhibition game against the USA Under-18 team where Donato scored a beauty on a tip in. Cameron Hughes, Jr. Wisconsin: 2GP, 2 assists, 2 PIM. Wisconsin split their 2-game series against Northern Michigan. Hughes is building off of a nice sophomore season by starting out strong once again. Trent Frederic, Fr Wisconsin: 2GP, 1 goal. Trent Frederic was the guy many labeled as a real reach by the Bruins in the first round of the draft this past summer. Perfectly timed by him, he scored his first career collegiate goal in Saturday’s win. He could really silence a few doubters this season with a nice freshman season. Jesse Gabrielle, Prince George, WHL: 2P, 3 goals, 2 assists, 2 PIM. No surprise here. Clearly riding high from a nice showing at Bruins training camp ol’ Jesse picked right up where he left off last year and should be making a sequel to his 2015-2016 40-goal season. Zach Senyshyn, Saute Saint Marie, OHL: 2GP, no points, 4 PIM. Not the start I am sure Senyshyn was hoping for. Not only was he held off the score sheet and hit the sin bin a few times but he also had the ugly looking -4 on the stat sheet as well. You have to wonder how much of his frustrating offseason will impact his first few weeks back in the Soo. Wiley Sherman, Jr. Harvard: 1GP, 1 goal. The big fella and Hotchkiss product ripped a hell of a clapper from the point for his lone goal on the weekend. Now as a junior, the long term project will be heavily utilized by coach Donato during a season where we could see a big jump in play. Ryan Lindgren, Fr. Minnesota: 2GP, no points. Lindgren was making his NCAA debut this past weekend in Alaska. Minnesota scored 12 goals on the weekend but Lindgren didn’t factor in on any of the goals. However, he was in the starting lineup for Sunday’s game. Cam Clarke, Ferris State: 3GP, no points, 2 PIM. Ferris State already has 4 games under their belt but Clarke has only dressed for 3. That didn’t prevent Clarke from getting some first defensive pair minutes for Saturday’s game. Jeremy Lauzon, Rouyn-Noranda, QMJHL: 2GP, 1 goal, 2 assists. Lauzon, who is the sleeper of the 2015 draft, had a monster start to his season to follow up a real good camp with the Bruins. He managed to show the B’s the potential of his raw talent in a few preseason games and will surely have a great season in the Q.
Jakub Zboril, Saint John, QMJHL: 2GP, 1 goal, 3 assists. Zboril was a monster, physically and statistically, including a one-timer he ripped from the point to give his Saint John club the overtime win. Expect this kid to be on the Bruins blue line next season. Yes, it’s only one weekend into their seasons but Bruins fans should be excited about these guys and the future. Their farm system is showing to be one of the best in the league regardless of NCAA or CHL hockey. They’re all producing. McAvoy might be the only lock as a top end amateur talent they have right now but they still have real skill throughout the system and a good balance between forwards and defense. The only problem is these prospects can’t help the Bruins this year. But they will before you know it. Next Next post: Is Jeremy Jacobs Serious?